(UPDATED 12.21.2017) The new architecture of the Intel Xeon SP (aka Skylake) CPU includes more memory channels, which is creating some uncertainty on best practices. In today’s post, I’ll show you the best configurations to consider to help drive high memory performance. Each Intel Xeon SP CPU has 6 memory channels, each with up to 2 DIMMs per channel (DPC) supporting a maximum of 12 DIMMs per CPU, or 24 DIMMs per server. While the maximum memory speeds available range from 2133, 2400 or 2666 (depending upon the CPU selected), the scope of this post is to review the memory population recommendations. Use a balanced configuration. In a balanced configuration, the memory is interleaved equally across all DIMMs; they uniformly have high bandwidth and they have a centralized memory region. 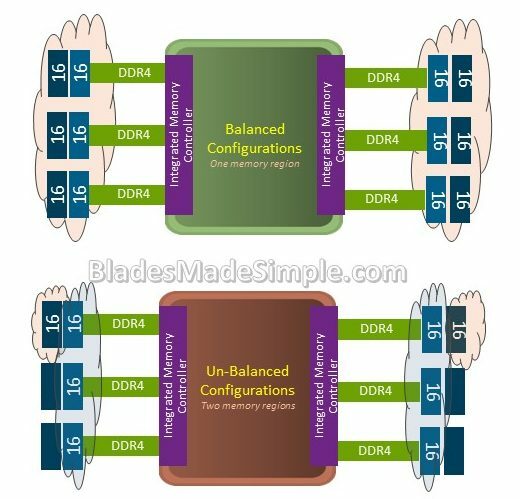 The best ways to be balanced are to use identical DIMMs in all location (size, speed, etc) and make sure all memory channels are populated equally. To assist you in reviewing what configurations are best for being balanced, download Intel Xeon SP Memory Performance Recommendations (PDF, 521KB, 2/26/2018 with corrected link – thanks to Chris Hurtt for pointing it out). Note this shows a 2 CPU environment. For single CPU, simply use half of the recommended designs. Use identical DIMM types in your server. This means use the same ranks, size, and speed. 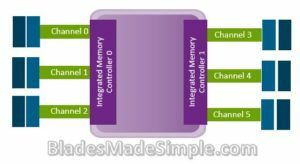 Use 1 DPC per integrated memory controller or duplicate the memory channel use across both memory controllers. As demonstrated in the PDF linked above, it’s recommended to fill up channel 0, 1 and 2, located on the 1st integrated memory controller, with 1 DIMM before moving to channel 3, 4 and 5 with 1 DIMM. In case you are wondering what the big deal is, in an “un-balanced configuration“, the memory is broken up into multiple memory regions creating an environment leading to unpredictable performance. Below is an image to help demonstrate balanced vs un-balanced memory configurations. In conclusion, make sure you take the time to understand what your options are. The PDF linked above (Intel Xeon SP Memory Performance Recommendations) should aid you in finding the right balance of memory is for your blade server. If I’ve left off any important information, if you’d like the Excel spreadsheet of the chart in the PDF, or if you think something’s not right, leave a comment below or email me at kevin AT bladesmadesimple.com Thanks for reading.